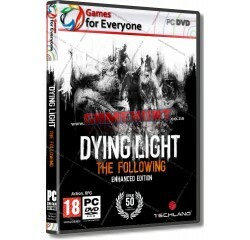 Dying Light - The Following 2in1 - 3 Disk - R280,00 : Game Hunt, Where we lead, others follow. Welcome to the Quarantine - Experience an original and intense story set in an infected city cut off from the outside world. Vast Open World - Players traverse an extensive world plunged into chaos and destruction. In this diverse environment, players must fight for survival against many kinds of enemies since the infected are not the only threat. Night Changes the Rules - In daylight, players explore the city searching for supplies and weapons. After nightfall, though, the infected world undergoes a dramatic transformation that gives the gameplay a new dimension. The hunter becomes prey. Parkour-Style Movement - Whether jumping between rooftops, climbing walls or attacking foes from above, players can move around the city with ease and speed. Dying Light provides freedom of movement never before seen in open world game. Brutal, Visceral Combat - Fight face-to-face using a diverse selection of melee weapons: knives, bats, axes, or more unusual tools of destruction. Players must strike down enemies or cut off their limbs to save their own lives. Craft Your Weapons - Why use an ordinary cleaver when players can attach a lighter for burning damage? Or wrap a hammer in electrified barbed wire? Dying Light lets players create their own weapon upgrades and construct increasingly efficient tools of combat. Choose Your Play Style - Players can make use of weapons, surroundings, and traps set by other survivors; provoke groups of enemies to attack one other; complete objectives by day or at night; or take advantage of darkness, fog, and storm to remain unseen. Breathtaking Visuals and Realism - Dying Light Is the first game powered by Chrome Engine 6 - the sixth revolutionary incarnation of Techland's proprietary technology. It delivers a new level of visual quality, special effects, and dynamic weather conditions, maintaining unparalleled efficiency at the same time. THE FOLLOWING - New Map, As Big as Dying Light: For the first time, you'll go outside the quarantine zone to get a glimpse at how the outbreak has ravaged those beyond the walls of Harran. You'll get thrust into a hazardous outback overrun by the infected and populated by pockets of survivors who consider outsiders just as threating. With a map the size of Old Town and The Slums combined,Dying Light: The Following is full of new environments, characters, quests, and secrets to discover. You'll need to adapt in order to survive while also use entirely new gameplay mechanics and tactics not previously possible in Dying Light to gain the upper hand. THE FOLLOWING - Drivable Vehicles: Break pursuits and travel through the quarantine like never before. All-terraindirt buggiesare going tobeyour key toolto survival and getting around this hazardous countryside. Level up your new 'Driver Rank' skill tree and upgrade your ride to create your most deadly and effective weapon yet.Fully customizable with specialized weapons, attachments, decals and paint jobs,your buggy is going to be your one-way ticket to zombie smashing mayhem. THE FOLLOWING - New Story: The survivors of Harran are reeling from the events that took place in Dying Light. With the city still under quarantine, there is little hope left and tension is running high. Players will again take the role of Kyle Crane, and will be thrown into Harran's outback region, rife withtheinfected, where they'll encounter a mysterious, and seemingly all-powerful cult, capable of changing the faceof Dying Light's world. To infiltrate and unravel dark secrets of The Following, Kyle Crane will need to face all-new challenges and use his abilities to the limit. THE FOLLOWING - Non-Linear Progression: Take control of your fate and tackle the missions laid before you as you choose. The newly introducedTrust Systemwill have youearningthe respect and confidence ofThe Following's cult leadersby completing tasks and missions they see as worthy of the cause.When and which tasksyou take on is entirely up to you. But as you earn more trust, you'll be granted more imperative tasksalong with access to dark cult secretswhich will help unravel the mystery that has taken hold of this once serene land. ENHANCED EDITION - Get all the additional content ever released for Dying Light in one go, including the Be the Zombie multiplayer mode, the Cuisine & Cargo challenge missions, the Ultimate Survivor Bundle, The Bozak Horde game mode, and much more. ENHANCED EDITION - Legendary Levels: 250 additional levels, allowing skilled players to keep on developing their character while unlocking new weapons, outfits, emblems, and skills. ENHANCED EDITION - Tweaks and adjustments include Legend System, Nightmare Difficulty, Bounties System, New Parkour Moves, New Enemy Attacks & Behaviors, #DrinkForDLC, New NPC Models, Enhanced Facial Expressions, Improved Human Enemy AI, Improved Volatile AI, Greater Firearm Variety, HUD and Video Filter Customizations, Audio Upgrades, Gameplay Quality Improvements, Performance Upgrades & Look and Feel Improvements. Processor - 3.3 GHz Core i5® or equivalent AMD® processor.